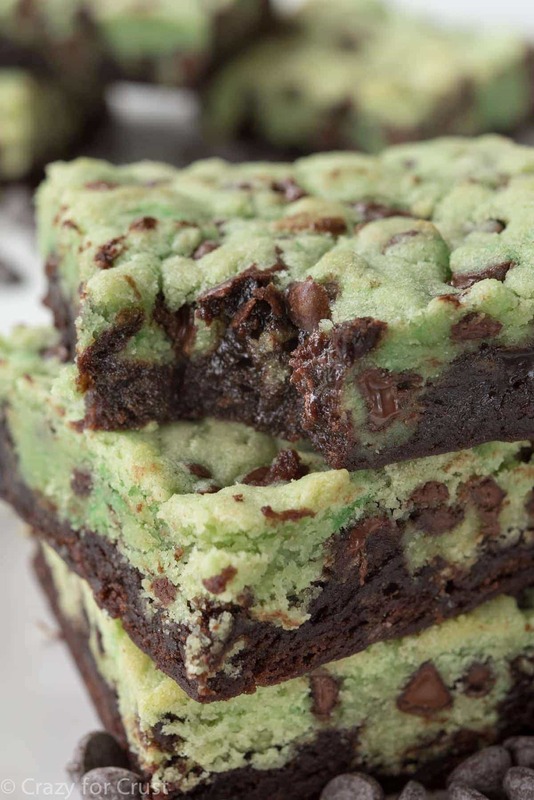 Mint Chip Brookies – When you feel like a cookie but also want brownies…make a brookie. When you love mint, you should make Mint Chip Brookies! Tomorrow, February 19, is National Chocolate Mint Day. Did you know that? I know it’s hard to keep up with all the food holidays (there are so many) but Chocolate Mint day is one that’s near and dear to my heart. Why? Because it’s also Jordan’s birthday…and mint chip is her favorite flavor combination! How in the world did my baby get to be 11 years old? I started this blog when she was in Kindergarten. She was 5. Now she’s a tween on the brink of all the important tween things. She’s in the fifth grade. In one and a half years she’ll be in middle school. She’s already begging for a phone. Jordan is an amazing kid – she’s one of my favorite people. She’s funny, smart, she loves teal and follows the beat of her own drum. Oh, and she’s my #1 taste tester…and she loves mint chip. I made these Mint Chip Brookies for her. Of course, I made them awhile ago, not for her birthday, but knowing I’d post them today. Every year she asks me to make her a new mint chip treat. There have been mint chip frosted cupcakes and brownie cupcakes, mint chip ice cream cupcakes and a mint chip cake roll. I’ve made mint chip scones for breakfasts and mint chip cookies for school. Last year I even served mint chip hot chocolate floats. What did she ask for this year? A skillet cookie and PLAIN brownies with lots of whipped cream. I’m sorry, who is my daughter and where did Jordan go? But it’s her birthday, so I’m going to do as she asks. I’m going to make this brownie recipe without the cookies, and make these chocolate chip cookies without the mint. So basically, I’m making this recipe again this weekend, ha! Good thing the two recipes that make up this one are SUPER easy. Brownies. I love my homemade brownie recipe that I’ve listed below. It’s the base I use for all my brookie recipes (and for my brownie pie). If you’re not in the mood to make a from scratch brownie, feel free to use a box mix. Either way, the recipe will work just fine. Mint Chip Cookies. 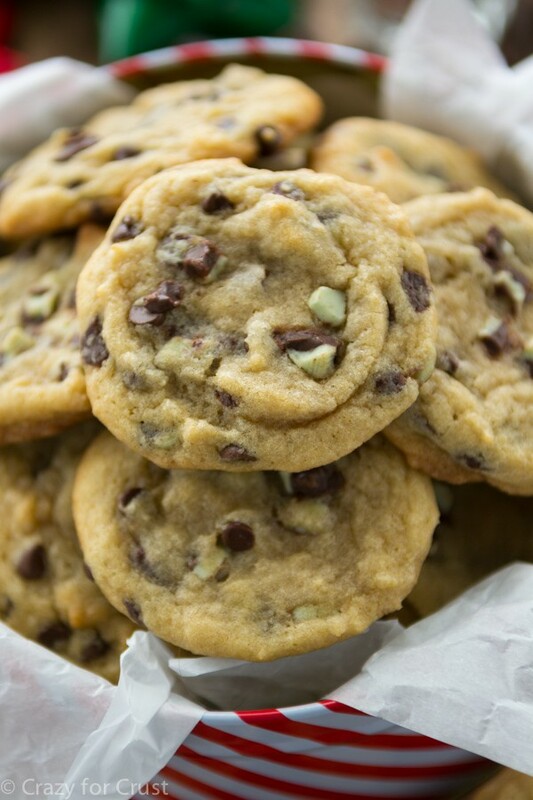 The cookie is my favorite chocolate chip cookie recipe, with some added peppermint extract and green food coloring. The green is optional, but gives the mint chip cookies that telltale mint color. Be sure to get peppermint extract, not mint. To me, mint extract tastes like toothpaste! You have to make two batters for this recipe, sure, but it’s totally worth it. What could be better than cookies and brownies all in one? 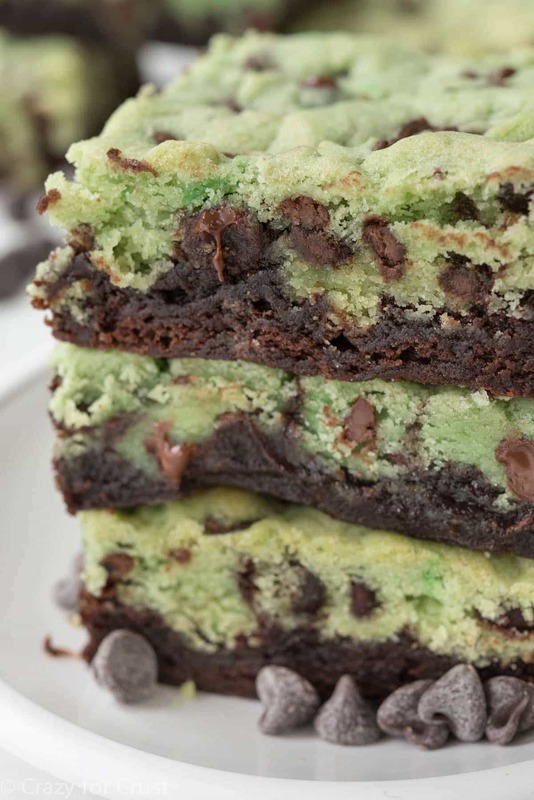 Mint Chip Brookies - mint chip cookies on top of fudgy brownies! 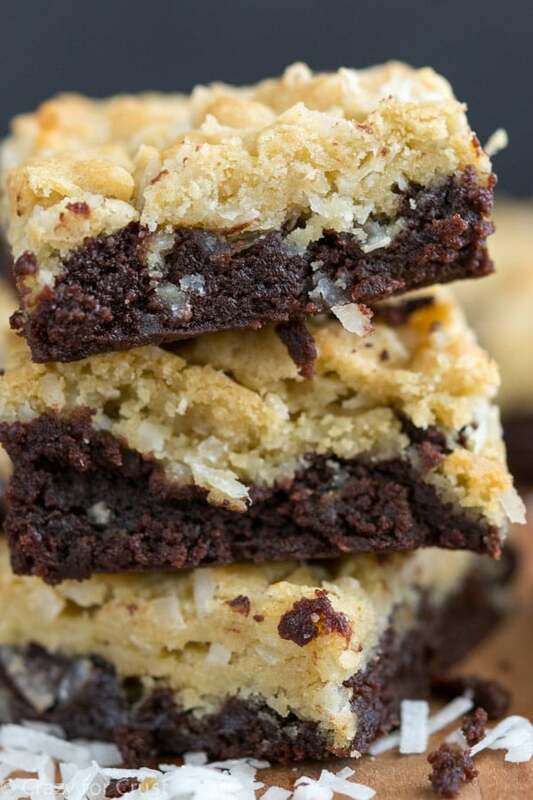 This easy recipe combines two favorite recipes: brownies and cookies make brookies! If you’re making from scratch brownies: Place the two baking chocolates and butter in a large, microwave safe bowl. Heat on HIGH power for 2-3 minutes, stirring every 30 seconds, until chocolate is smooth. Stir in sugar. Add eggs, vanilla, and cocoa and stir well. Add flour and stir carefully. Set aside. 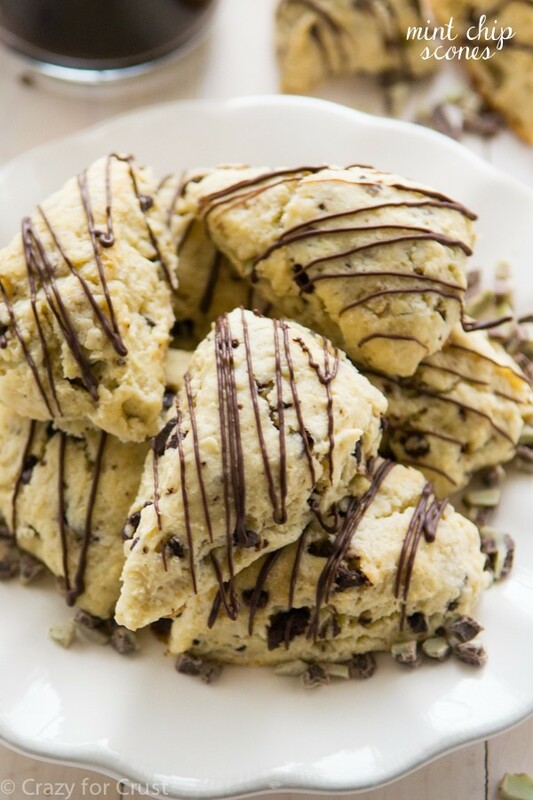 Make the cookies: Cream together butter and sugar in the bowl of a stand mixer or in a large bowl using a hand mixer. Mix in egg, extracts, baking soda, and salt. Stir in flour, then stir in food coloring if using, being sure to scrape the sides of the bowl to make sure all the dough gets turned green. Stir in the chocolate chips. Bake for 30-40 minutes until the tops are starting to get golden. The toothpick test in the center will come out with some crumbs on the toothpick. She didn’t beg for all things mint chip? Well, I guess kids and their tastes both change really quickly. I’m with her on the skillet cookie, though. Those are the best! But really, why choose? Because these brookies are gorgeously incredible, so can’t we eat it all? Your daughter is so smart! Mint chip is seriously the best flavor ever! & these brookies (or should we call them Jordies 🙂 ) look amazing. Happy Birthday, Jordan! These brownies are making me so excited for St Patty’s Day 😀 Pinning! I kind of want these for my birthday now, but it’s too far away. I’m not waiting that long. ? Mint and chocolate and chocolate with caramel are my two all time favorite combos. I love ANYTHING mint, so I am not sure how I missed tomorrow is mint day! These look fantastic! And happy birthday to Jordan! Wow, these look great! I can’t believe that she didn’t want them for her party. Then again, maybe she’s thinking of her guests. Not everyone loves chocolate mint. 🙂 Happy Birthday to Jordan! Awww happy Birthday Jordan!! These look incredible, I’m a big fan of brookies! I love when two desserts collide! Isn’t it crazy our kiddos are getting so big. My youngest was in K5 when I started blogging too…and now he is 12. Not cool! Happy Birthday to your sweet girl. I love that she is her own person and ok with it! She is awesome!!!! I am so in mint chocolate mode right now too! But I’ve never made a brookie before..this has me inspired!